Pirate MMO Atlas Hits Steam Next Week | Nerd Much? 2018’s Game Awards was by most accounts a tremendous success. There were a bunch of new trailers for games that we already knew about, and many more for titles that we didn’t. 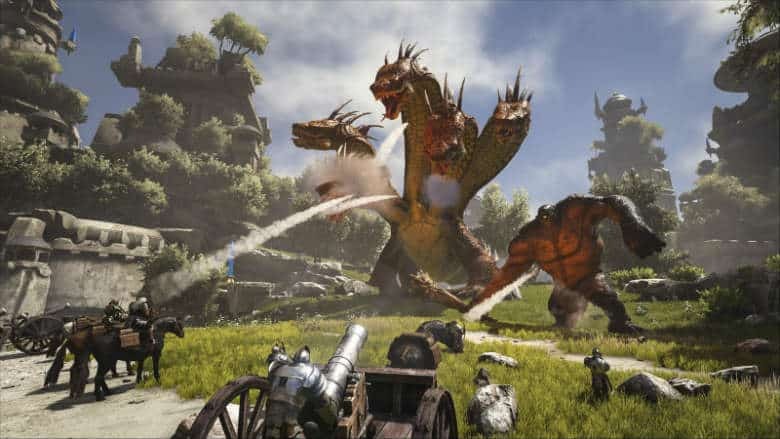 One of the world premiere games at the event was Studio Wildcard’s newly announced Atlas. A vastly open-world pirate through that crashed in and stole the show. While Atlas looks to be a pirate game at heart, a large portion of the game with take place on land as well. In just the opening moments of the debut trailer we see a battle just outside of a city that features at least half a dozen soldiers fighting a four-headed dragon and a colossal troll. Some soldiers are on foot, a couple are on horseback, and one is attacking with a canon from a distance. It’s not just giant monsters on land though, of course. The Atlas trailer immediately cuts to a man jumping from a small boat as a humongous hammerhead shark attacks. We then see a larger boat witnessing a large whale-like creature pass closely by. It’s unclear whether this behemoth is passive or not. Back to the city we go as we see more castle-centric combat. There’s a floating fire demon attacking players now. And then a quick montage hits that shows a dungeon horde, a bar fist fight, and a boat deck sword duel. We’ll stay on the floating vessels for a bit longer and witness a player climb atop a ship’s crow’s nest. It’s quite the beautiful view, but don’t let your guard down, because an enemy ship is crashing read to ram as canon fire rains down. The trailer’s focus stays on naval warfare for a bit, proving this is the central focal point of Atlas. And it concludes with a dragon floating over the seas blasting breaths of fire upon a stationary fleet that looks unable to retaliate. Studio Wildcard is also promising some incredibly ambitious tech behind the scenes. They state that the map for Atlas is 1,200 times larger than their prior release, ARK: Survival Evolved. And they also tout that servers will host up to 40,000 players simultaneously. Hopefully these aren’t just loft ambitions, and instead, achievable goals. There’s a lot going on in Atlas, and it makes you wonder how long it will take for Studio Wildcard to get the title out onto platforms. Well, that was another portion of the title’s magnificent news – Atlas releases onto Steam on Thursday, December 13th. The team plans to also release on the Xbox Game Preview program sometime next year.